I'm back after a very long break from blogging. Little did I realize when I wrote my last post I would have to take an extended off from blogging and the demands of a baby( now my adorably cute tot) would keep me busy round the clock. It's been a lot of fun nevertheless and I missed updating here. Since I was missing in action all these months, the Daring Bakers Challenges took a back seat too. I used to check on the challenges but never got around to attempting them. This month I decided this would be the post that would revive my blogging. I chose to make the Mawa cake and the Bolinhas de Coco cookies. Fresh mawa or khova/khoya isn't easily available where I live. It is used in a variety of Indian sweets. Mawa is basically the milk solids that result after boiling down whole milk for a long time. I needed just this excuse to make it at home. 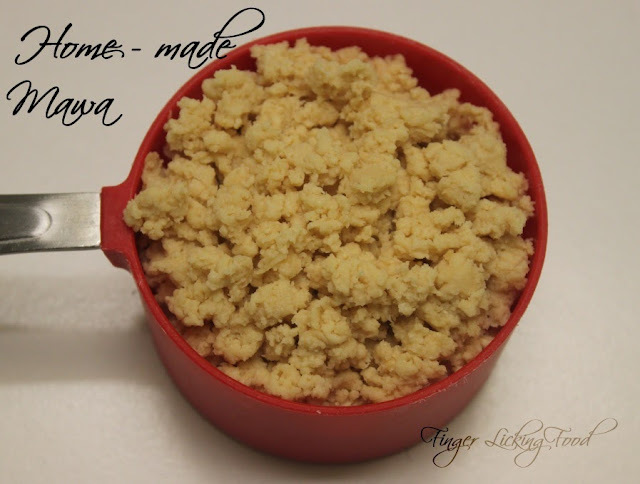 1 to 2 hours to make the “Mawa”. 15 to 20 minutes to mix the batter. About an hour to bake the cake. • Heavy thick bottomed deep pot/ pan, preferably non-stick, large enough to comfortably hold a litre (4 cups) of milk. It took me close to two hours for the milk to completely reduce and form the mawa. Now start preparations for the cake by pre-heating your oven to moderate 180°C/350°F/gas mark 4. Beat the butter, the crumbled mawa and the sugar in a largish bowl, using a hand held electric beater, on high speed until soft and fluffy. Add the eggs, one at a time, and beat on medium speed till well incorporated. Add the vanilla and milk and beat till mixed well. Sift the cake flour, baking powder, cardamom, and salt onto the batter and beat at medium speed and well blended. If you cannot find cake flour, place 2 tablespoon of cornstarch in the bottom of your 1-cup measure and then fill it with all-purpose (plain) flour to make up to 1 cup. Grease and line only the bottom of an 8 inch (20 cm) spring form pan. Pour the batter into this and lightly smooth the top. 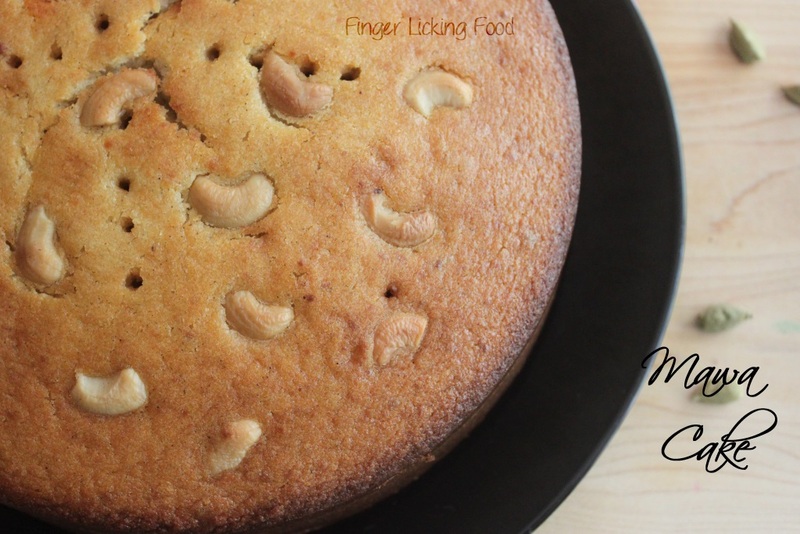 Place the cashew nuts (or blanched almonds) on top of the batter randomly. Do not press the nuts down into the batter. A Mawa Cake always has a rustic finished look rather than a decorated look. Bake in a preheated moderate oven for about 1 hour until the cake is a golden brown and a skewer pushed into the centre comes out clean. Do not over bake the cake or it will dry out. If the cake seems to be browning too quickly, cover it will aluminium foil hallway through the baking time. Remove from oven and allow it to cool for 10 min in the pan. 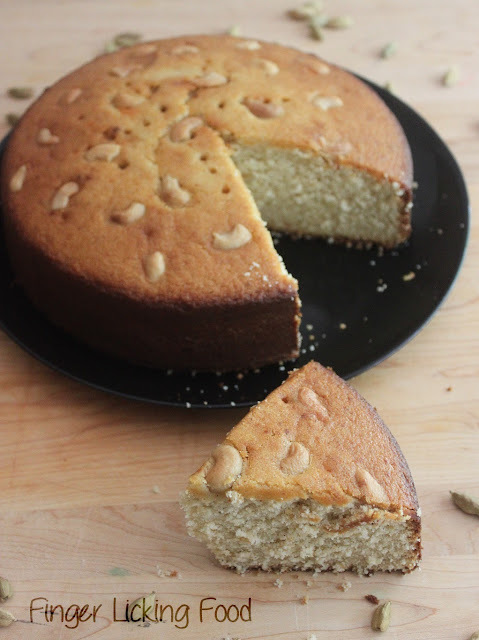 Release the cake, peel off the parchment from the base and let it cool completely on a wire rack. Put the semolina in a pan and toast/ roast it, over low to medium heat, until it starts giving off an aroma, and looks like it’s about to start changing colour. This should take a couple of minutes. Do not brown. Transfer the semolina into a bowl and keep aside. In the same pan, pour the water and add the sugar to it. Place it on medium heat and keep stirring until the sugar dissolves completely. Once the sugar has dissolved, keep stirring the solution and let it cook for about 2 minutes. Turn off the heat. The sugar solution should just begin to start forming a syrup but is still watery. Do not cook until it forms a thick syrup. Add the toasted/ roasted semolina and mix well. Then add the coconut, salt and ghee (or melted butter) and mix well. Put the pan back on the stove, and over medium heat stir the coconut mixture until it is really hot and easily forms a thick clump. This should take about 2 to 3 minutes. Whisk the egg whites by hand until frothy and add to the dough. Mix well till incorporated. You will now have a slightly moist and sticky dough. Refrigerate this dough for about half an hour so it firms up a bit. Pre-heat your oven to moderate 180°C/350°F/gas mark 4. Line your baking trays with parchment or grease them well with some ghee or melted butter. Take the dough out and pinch off walnut sized bits of dough. The dough should be firm enough to handle without difficulty. If the dough is sticking to your palms, lightly dust your palms with flour before shaping the dough. Roll the bits of dough into balls and then flatten them very slightly. Decorate the top by marking criss-crosses (3 equidistant lines one way and another 3 crossing them at right angles), with a table knife. Press down a bit but not too deep or right through the biscuit/ cookie. Use up all the dough this way. Place the shaped dough on the baking trays leaving a little space between them. Bake in a preheated moderate oven for about 20 to 25 minutes until they’re a golden brown and done. 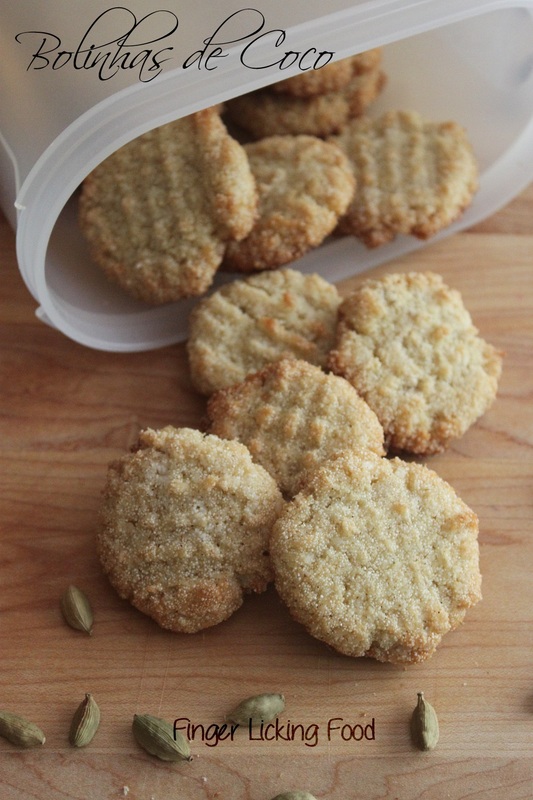 Let them cool on the sheets for about 5 minutes and then transfer to racks to cool completely.Store the biscuits/ cookies in airtight containers. This recipe makes about 4 dozen Bolinhas de Coco. Thanks to Aparna for a fabulous cake & cookie challenge! Both the cake and cookies look delicious - I wish I had either (or both!) to snack on right now! The mawa cake and cookies look so lovely. I missed these cookies as I do not like the coconut flavour. 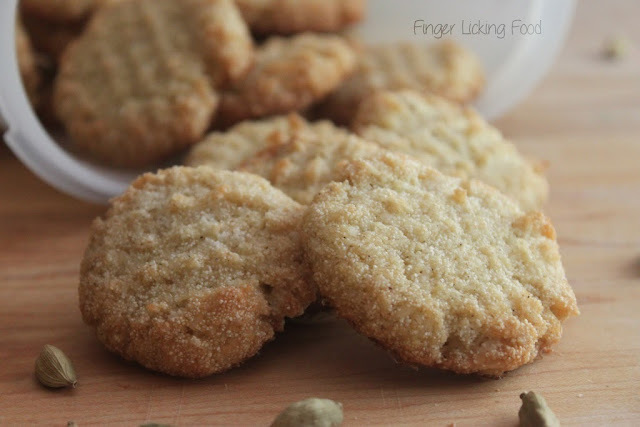 I tried the masala biscuits and fell in love with them. Welcome back! Yes, a new bub is certain to reduce the time you have to yourself! Your cake and cookies look perfect! Welcome back to the challenges! Your cake and cookies look great. Both your cake and cookies look beautiful! Kind of envious of that flat top you managed to get on your cake, mine rose and peaked quite significantly in the middle. Your cake and biscuits look delicious!!! Mawa isn't available in Germany (I have to admit I have never looked for in asian shops). But that is why I love the Daring-Bakers challenges: All is made out of basic ingredients.